I was so pleased with Aero on Saturday that I booked a lesson with Frank O’Sullivan in Skevanish for Tuesday. Sunday’s ride turned out to be pretty lacklustre, though, and I ended up wondering if I was going to make a complete fool of myself in my lesson! It had rained heavily on Satruday night, and when I thought about it afterwards, I came to the conclusion that he had been cold and stiff as a result. In addition to that, Sunday was the first time I schooled hime without lunging him beforehand, so he hadn’t had a chance to loosen out without me on board. 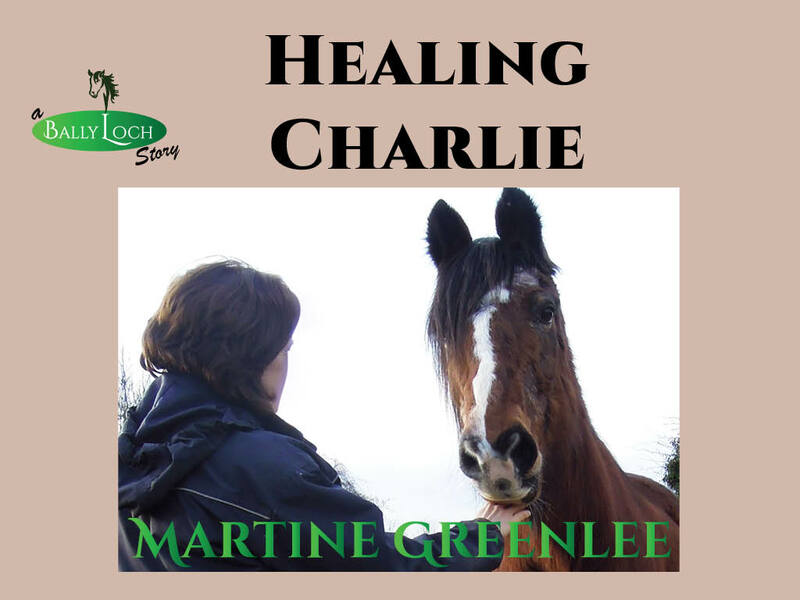 I never felt the same connection that I’d felt the previous day, but when he had softened a small bit in trot, I finished up. I’ve still got “arena sour” on the brain. Monday morning, I played with boots. Flurry’s size 2W hind boots are ok-ish on Aero’s front feet, once I adjusted the cables a bit, so with his own size 2 boots on behind, we set off for a little hack on the road. The sun was shining, the road was quiet and Aero strode along happily, enjoying every minute of it – exactly what he needed, I think. Tuesday I went for that lesson! It started off just awful, he was going around inverted, not particularly excited and not misbehaving, but very tense. I love Frank’s approach though, never rushed, never stressed, no shortcuts. First off all we worked on getting longitudinal softness by asking for lateral bend. 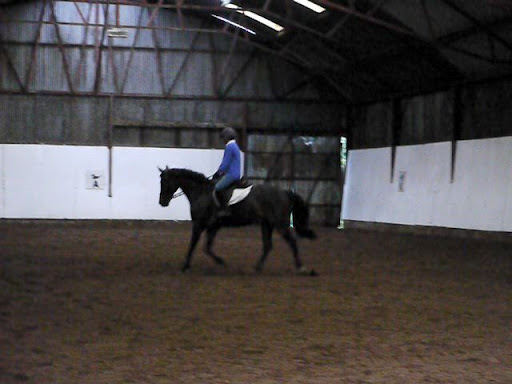 Once I insisted on inside bend on circles and kept on doing little give/retakes with the inside rein, Aero started to snort, relax and work over his back in both trot and canter. We followed this with leg yielding to engage the hind leg and help keep that suppleness over the back, and finished up with Frank saying he reckons I’ll have great fun with him! What’s most exciting for me, though, is that I’m actually feeling like I will one day be able to ride this horse. In the past, I couldn’t do more than twenty minutes schooling on Aero without my back starting to complain. Whether it’s the riser pad (ahem) or the fact that I’m so much fitter than I’ve been for years, I don’t know, but it was a good 45 minute lesson, working pretty much the whole time, and I felt 100% afterwards. When we got home from the lesson, poor Aero had to cope with some disruption to his life! We took Pepper away to keep Gigi company so that I could bring Flurry home. Lilly was quite upset without Pepper, she’s been with him for over a year now, and she was calling frantically after him as we drove out of the yard. By the time we got back with Flurry, she had settled but she was clinging to Aero like a leech! I wasn’t too worried about turning Flurry out with them, as they were all out together before we went to France. However, that was when Aero was depressed! This time, there was quite a showdown, but Aero quickly realised that he was outgunned by Flurry and they settled down. It’s interesting to note that the most dangerous kick came from Lilly. Although the two boys were “making shapes” initially and Flurry ended up throwing a few kicks in Aero’s direction, they both gave plenty of warning signals and neither of them ever connected – I’m sure if either of them wanted to harm the other, he could have. Lilly, on the other hand, acted like the immature little lady that she is, and blasted out both hind legs in a moment of excitement, catching her friend Aero in the process. Thankfully he wasn’t hurt, but it’s a great demonstration of how a horse can unintentionally injure someone, human or equine, just by being a horse. Watching all this, and watching them interact over the next few days, it seemed to me that Flurry just might be the new King. Even though Aero and Lilly are a pair and are excluding him, he’s first in line for food or for my attention. One flick of his ear, and the other two get out of the way! I’m quite sure that Aero and Flurry will eventually be the best of friends, though, especially when I manage to find a home for Lilly. After another few days, though, it’s starting to look like Flurry is too lazy to be bossy all the time! All three are very peaceful now, and Flurry is fully integrated with the other two. I was absolutely dying to ride Flurry, so I gave Aero a day off on Wednesday (he probably needed it after his lesson, anyway) and rode Flurry instead. Ah Flurry! I was using the Micklem bridle with Aero’s bit, a jointed rubber snaffle, instead of his usual bridle with flash noseband and French-link type snaffle. For the first few minutes I thought he was going to be really heavy and leaning on me the whole time, then it was like a lightbulb moment : “Oh, I’m in the arena! I’m meant to go in an outline now, not like a cowboy horse!” He rounded up, bent to the inside and listened to my aids. His transitions were good, even the downward ones which I’d had noticed were particularly rusty while we were trekking. 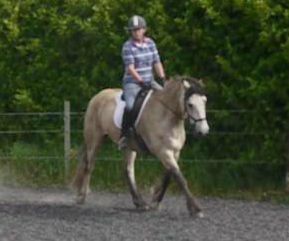 I even threw in a walk/canter, just to see if he’d do it – he did! I was so delighted with him that I’m now thinking of bringing him to a show on the 17th! The complicating factor is that my best friend’s 50th birthday party is on the night before – there’s a fair chance I might be a wee bit hungover after that! Unfortunately the cold I’d been fighting took hold, and that, coupled with the torrential rain, was enough to put me off riding the next day, so lucky Aero got two days off. The following day was pretty windy – the sort of wind where you can’t breathe properly if it’s blowing in your face. I’ve got enough confidence in Flurry to ride him in any weather, so he got ridden, but I definitely don’t have the same relationship with Aero, so he was just lunged. They got their flu shots, too, and Lilly got micro-chipped – she was a little angel, she really has a lovely temperament, it’s such a shame about the sweet itch. I finished off the week schooling both horses briefly on Sunday morning. I videoed Flurry’s ride (with the LSH’s camera!) and then I spent a lot of time later on that day looking at videos taken during the week of both horses. 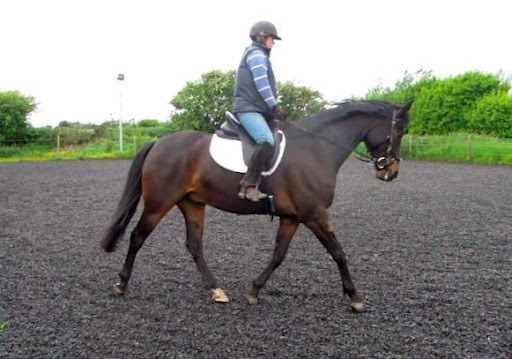 I can see quite clearly that I need to shorten up my reins – Frank doesn’t say this directly, but he takes a stealth approach to it by getting me to do things for which I will need shorter reins and which will help the horse to engage. 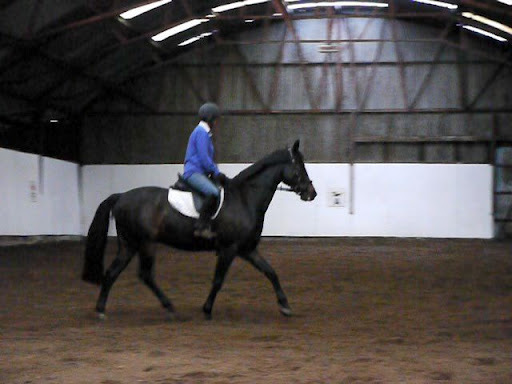 Every other instructor I’ve had in the past year has said I need to shorten my reins, and I truly believe them! I’ve a different problem on each horse. 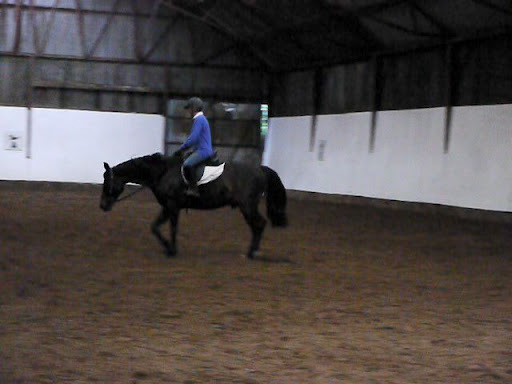 On Flurry, if I shorten my reins, he leans like crazy. Both of my wrists are weak – my left one developed a ganglion when it had to take over extra duties while the right one was in a cast, and the right one is still not back up to full strength. So I really can’t cope with him leaning on me, and I end up slipping the reins to ease the pressure, he pokes his nose and we’re back to strung out on the forehand. On Aero, if I take up a contact and try to “make” him accept it, he resists – the only approach with him is stealth, as practiced by Frank! But I never know how much to shorten my reins when he does accept the bit, and if I go too heavy-handed, I’ll just end up with him resisting again! 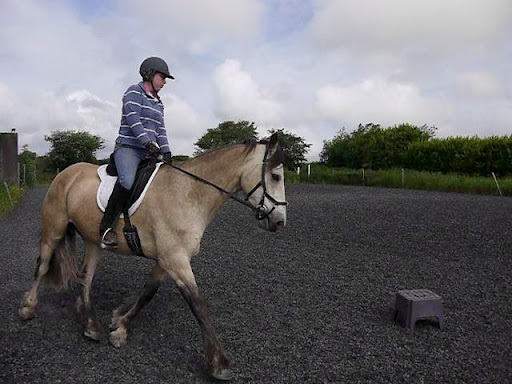 So I’ve some questions for my lesson tomorrow, but I think the best thing I’ve taken from the videos is a mental image of where my reins (and hands) are and where they actually should be. Where they should be! It’s nice when it’s right! They're all different… as Annette says below! It sounds like you had a great lesson. Interesting how each horse is so different — and how it makes us better riders since there are different things to learn and do on each. Good rides!I have to keep a tight rein on Shy, too. If not, her head goes up and she decides not to listen. Something we are working on. . .